With the quick development of smartphone, we now get more and more important information on phones. Hence, the storage space of the phones tends to be insufficient for most of us. It is good that Apple provides iCloud storage to make up that. However, only 5GB is offered free, which is still not enough for many people. You need pay if you want more. You must be wondering if there is a way to easily back up the data on your iPhone without paying for iCloud. This article will definitely be of great help to you. 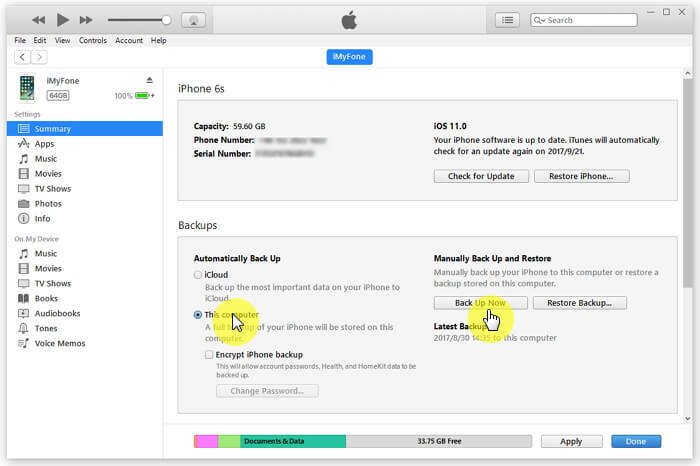 It takes you through how to back up iPhone without iCloud. Read through to learn more. Step 1: Connect your iPhone to the computer then open iTunes. Step 2: Ensure that you have disabled iCloud on your iPhone; go to "Settings", to iCloud then backup and storage and turn it off. Step 3: Click on your devices when it appears on iTunes. Step 4: Finally click on "Summary" then "Back Up Now" to complete backing up your device with iTunes. This is how easy it is to back up iPhone using iTunes, and iTunes always supports to the latest iOS version, including the iOS 12. 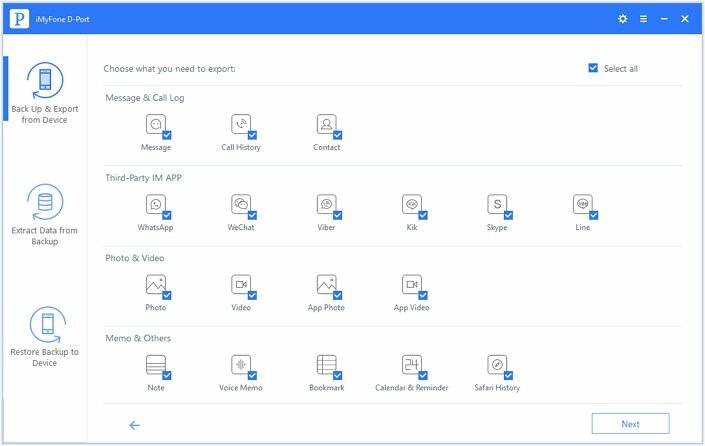 Supports 20 file types like text message, notes, WeChat/WhatsApp/Kik messages, videos, call history, contact, voice memo among others. Exports data from iOS devices such as iPhone 4s/5/5s/5c/6/6s/SE/7/8/X, iPod touch 4, iPad Air 2, iPad mini 2, iPad Pro, iPad mini 3, and supports various iOS versions including the iOS 12 and others. Supports to backup your device completely or partially. With the guide below, you can selectively back up data using iMyFone D-Port iPhone data extractor. First, ensure that iMyFone D-Port program is running on your computer and your iPhone is connected. Hit Back Up & Export from Device tab. Thereafter, hit on "Export Data" button. Choose the important data that you wish to back up and click "Next". Then the program will start to scan your iPhone. 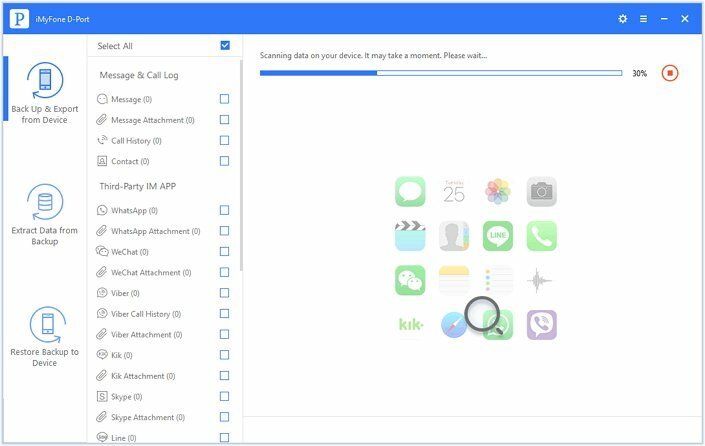 After the program finishes scanning your iPhone, it displays all the data that you can export and save on your computer. Check the data and pick the ones you want to extract. Then hit on "Export" button. Choose a location to save your data. 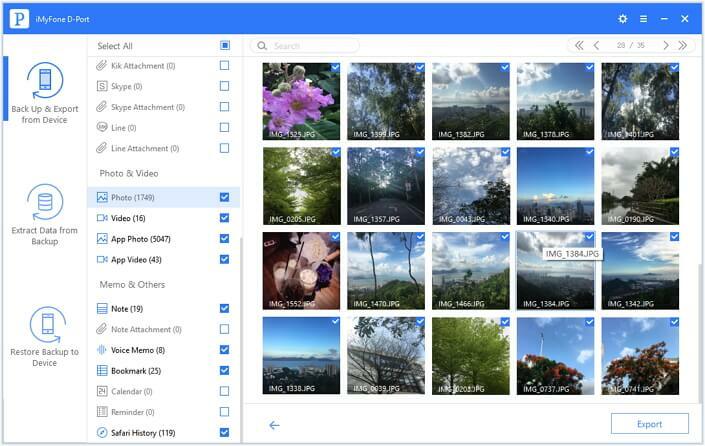 A backup of your iPhone will be stored on your computer. 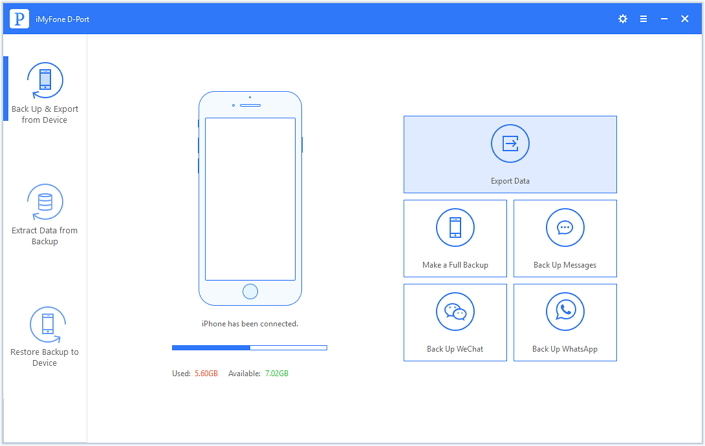 You will easily make a backup of your important data using iMyFone D-Port (compatible with iOS 12). Why not have a try of the free trial version?